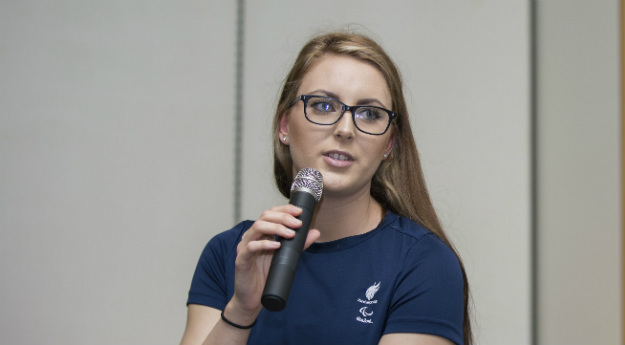 Jessica Jane Applegate followed the Commonwealth Games on TV this month as only male athletes in her para-sport classification were permitted to compete. A Paralympics GB team mate with a learning disability went on to break a world record in Australia but it barely got a mention. I’m one of the fortunate athletes with a learning disability who has been able to progress to the top of my game and compete in many competitions, including the Paralympics, winning gold in 2012 and two silvers and a bronze in 2016. Sadly, for many other athletes with a learning disability, they will never get that opportunity. Currently, the only events open to us are swimming, athletics and table tennis, which is an issue that desperately needs addressing. I spoke about it at a meeting in Parliament this week organised by the learning disability charity Mencap. Despite my past success and my proven record, I still wasn't able to go to Australia to compete at the Commonwealth Games this year – another issue I raised at the Parliamentary event. Not because I'm not fast enough, or because I'm injured, or even because S14s (the learning disability classification) don't have an event – they do. Well… the boys do! The girls weren’t included in any events, which was really sad. As I wasn’t allowed to go along, I managed to follow it on TV instead. People keep saying the coverage of the Para events was better than ever, which it possibly was. However, when it came to the learning disability athletes, there wasn't too much. On this occasion I believe that was mostly due to there not being much for them to take part in so there wasn't much to cover, but it’s a recurring issue. A fellow teammate broke a World Record in the 200m freestyle at the Games, which is great, but it didn’t raise the profile of learning disability sports. It would be awesome to see learning disability athletes getting the same coverage as ‘regular’ athletes by Tokyo 2020. I think this can be done with better communication between athletes, coaches and the media, and with everyone clubbing together to make an effort to change things. "We've had lots of media training so we know the ‘dos and don’ts’ and we shouldn't have to be ashamed or apologise for our disability." A big issue is that, like the public, the sporting world doesn’t understand what a learning disability is or how it affects people. I’ve been told I might not be ‘disabled’ enough to be a para athlete. But that’s because people don’t understand that an invisible disability can affect someone’s whole life. We can struggle to understand training information, getting to venues and tactics. When I first started swimming I used to get disqualified a lot and it was only through my coach working with me that I learnt how to stop this from happening so frequently. It still happens sometimes and I need constant reminders. A lot of people are suspicious because they remember the Spanish Basketball team who in 2000 cheated, and faked having a learning disability. It makes them doubt the rest of us. That was a horrendous incident and it haunts athletes with a learning disability today. Since then we still don’t have access to as many sports as we did in 2000. Another issue is that some reporters are often scared to interview us and they’re concerned they won’t know what to ask or be able to communicate with us. We've had lots of media training so we know the ‘dos and don’ts’ and we shouldn't have to be ashamed or apologise for our disability, that’s who we are and what makes us so unique. We offer a different perspective on things. In Rio, 7% of medals (12 out of 147) won by Team GB at the Paralympics were won by athletes with a learning disability, despite them making up just 3% of the overall Team GB. Even after this success, we have missed out on a lot of the change in attitudes that the Paralympics has given to other disabilities, and we deserve this too. I’m currently training very hard towards trials for the European Championships, which I’m hoping to qualify for. They are being held in Dublin in August 2018 and I’d love to be there representing Great Britain. I love wearing my GB kit and making everyone proud. I want to continue doing my best and raising the profile of learning disability athletes to prove what we can achieve. More media coverage would be very welcome. Jessica-Jane was assisted to write this blog.